On arrival at the Lanzarote Apartments you are reminded of this island's unique landscape, with a variety of volcanic rocks and plants decorating the reception area. Recently refurbished these spacious, modern apartments enjoy views of the colourful garden. when arriving at apartments lanzorote i must admit i was a bit put of with the fact it was such a big hill, getting up it was ok but going down it i found it quite slippery. The apartment we stayed in was nice but we had so many ants in our kitchen that we had to ring three times during our stay for someone to spray. I did enjoy my stay but we did not have cleaners everyday, and there was definately no entertainment, I enjoyed my week there but if i was going to go to lanzorote again i wouldnt stay there. the apartments were cleaned alternate days, but the towels were only changed once! in our ten day stay. The apartment 303 had some road noise but wasn't troublesome. would advice to get a first floor apartment as we had a few cockroaches on the ground floor. A pool view was much nicer. Kitchen facilities were ok, toaster, two hobs and oven, fridge and kettle. TV available but only a couple of channels in english. (but who wants to go on holiday and watch TV. The food was basic but more than acceptable, ideal for snacks by the pool. The hotel was at the top of a hill( well a incline!! )but tiring in the miday sun. the pool was on the small size, plenty of sunbeds available above the pool as well as round the pool. (up the steps near the toilet) dont think there would be enough to go round in childrens schools hols. pool side very very slippy!!! all in all an enjoyable stay. I stayed in this apartments last year with a large group of friends, and we all thought the apartments were nice especially the staff, the food was lovely as we discovered that it was from Ireland itself!! Me and my partners apartment was crawling with ants but after I bought an ant killer we never really seen anymore!! Pool was lovely as well. But the walk to the town was very dangerous as there were a lot of broken tiles which near made me land flat on my face!!! Overall I would go to these apartments again!!!! We stayed here in August 2006 and before we went I could hardly find any reviews about the apartments which was begininning to worry me. Once in resort we toured around dropping other guests at their hotels/apartments and we were the last ones to be dropped off - On driving at the back of these apartments I said to my daughter "I hope we are staying there" the apartments looked lovely and after seeing what we could have ended up with i'm very pleased to say that it was the Lanzarote Apartments I had spotted. The Apartments were extremely clean, I never seen one ant or one cockroach on the complex. We had maid service 5 days a week - we even had the maintenance men on our roof washing it, they liked the place to remain spotless. A couple of our bulbs weren't working in the room but as soon as they were reported they were fixed, couldn't fault the staff at all. There is a 24 hour reception although at night it is just the security man who can't really understand what your saying but its nice to know you aren't alone. The apartments are either a terraced area or a balcony - we were on the first floor so we had a balcony. Lots of stray cats around the area at night but the Owners requested you did not feed them as to not encourage them. The pool area is in my opinion a little bit scary if you have youngsters (although I have to say my 2 were fine) but I did see a few accidents when children were running round the pool area and falling and hurting themselves. To get to the pool area you have to walk down a few steps and the heat can be unbearable as you are trapped down below and no wind is coming through - we usually stayed on the terraced area upstairs which was much better. There is a restaurant on site but to be honest we only used it one day for drinks and a quick snack, husband said it needs to be decorated its like something from the 70's! (I have been advised New Owners have just taken over so this may change). Location - now this is the difficult one - the apartments are at the top of a bank which seems fine when your walking down but getting back up is another matter - it takes about 10 minutes and by the end of your holiday you are used to it but if you have walking difficulties you may prefer to get a taxi, the taxi's are really cheap I think we paid 250 euros which is hardly anything. Location within the resort of Puerto Del Carmen is really good but it is just the bank that you need to be aware of. Entertainment - I never seen any but did hear some music coming from the restaurant on some nights - beaware that the restaurant closes at 10pm. We always went out for our evening meal and we never stayed in the apartments other than for sleeping really. 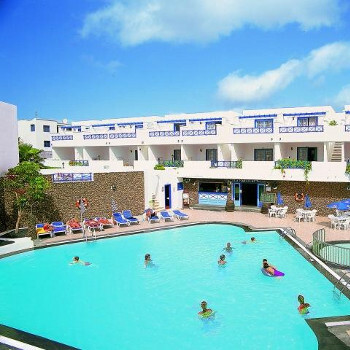 I wouldn't visit this hotel again simply because I've been to Lanzarote twice and to be honest this isn't somewhere that is child friendly - it would be much better if there was entertainment on every night so you could stay in the complex and not worry that the children would be bored. There is a computer/internet in reception so you can always chat to the folks back home. Netto is just down the road so you can buy all your groceries. The hotel says that they have a gym/sauna - i never seen any evidence of this but by the pool there was an area I never ventured into so quite possibly thats where it is but I can't be certain. Don't let anything in this review put you off, this is a personal review but the apartments were lovely and they couldn't be faulted. The holiday was a late one but this accomodation came recommended by the travel agent. They are easily pleased it was the worst place we have ever stayed in. There was no clean towels or the sheets on the beds were not changed while we were there. They had advertised that there was a sauna on site where it was I don't know there was a lot of false advertising. Ants it was terrible they were all over the apartment we had to ask for it to be sprayed it was disgusting they were even over the cooking area, it was never used. No entertainment, the bar shut at 5pm. What use is that. Would not recommend this accomodation to anyone. Hotel was a nice walk 10-15 mins downhill to the main strip. The road had 3 supermarkets and several bars which was ideal for self-catering. The apartments were spotless and cleaned every other day. Pool area was also very clean. The only down side was the food and drink bar it closed every day at 5pm [Sundays 4pm]- closed all day Wednesdays!!. Would I stay there again -- I don't think so, I would look for an apartment block which offered entertainment.